What a frilly dream ! 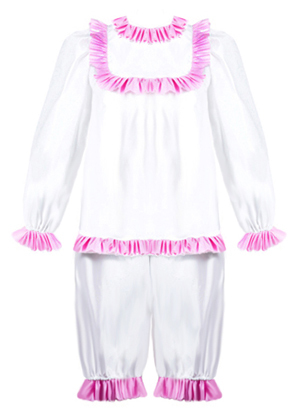 Amazing Set: Frilly Top and matching frilly pants trimmed over and over with wonderful frills. A Must Have for all lovers of stunning playful daywear or cosy nightwear for sweet dreams. The top is closed with a zipper at the back (on option with front zipper) and has elastical sleeves for comfort, the pants are elastical at the waist and legs. The set is trimmed with detailed frills and available in many wonderful glossy colours and fabrics. Additional options can be chosen like high neck, short sleeves, long legs, matching mittens etc. More fantastic products like the matching booties, Female Masks, Silicone breasts, socks and stockings, wigs and many more are also available in our shop.